If you have a heart, root for no draft-day trades. Three years ago, Minnesota selected Michigan guard Trey Burke only to immediately send him to Utah. Burke had an inkling he'd be traded as soon as his name was called, making his ESPN and NBA TV interviews -- during which he donned a Timberwolves hat -- especially awkward. Real-life trades don't happen like they do in fantasy sports. The league must approve the terms of the deal. Burke spent two hours in a holding room, knowing he'd been dealt but unsure of the particulars. As Kentucky big man Nerlens Noel awaited approval of his trade from New Orleans to Philadelphia, Burke told him, "They just said I got traded. To Utah. I'm all up in the air right now." There will be plenty of uncertainty again in the hours leading up to Thursday's NBA draft and continuing throughout the night. Before heading to Barclays Center, many of the top prospects will be in hotel rooms watching TV analysts speculate where they'll spend the next few years of their lives. The "experts," like the players themselves, have little concrete information. One thing is certain: As much as the players dreamed about this day, by Thursday afternoon they just want it to end. I won't be in Brooklyn for this year's draft. But after shadowing first-round picks each of the past three years -- Burke, fellow Michigan star Nik Stauskas and Wisconsin's Sam Dekker -- I've got a sense of what draftees will be thinking on the biggest day of their lives. Some prospects will admit they are nervous, and others will lie. Think about your own career: Deciding where you worked may have been stressful, but the choice was yours. These young basketball players have no control over what city they'll be working and living in. It's unsettling. None of the three players I covered had ever even been to the cities they'd eventually call home. Mock drafts are now a 12-month enterprise. But remember the definition of mock: Not authentic or real. Nothing more than speculation. How could they be anything more? The teams themselves often don't know who they'll pick until minutes before they must decide. The rumor mill churns harder as the draft approaches, so at the midtown Manhattan hotel on draft day it nearly spins out of control: I'm hearing the Lakers like Buddy .... Boston's trading its pick ... If Phoenix takes Dragan, that opens things up. Whether it be an agent, a writer or a scout, nobody knows anything for sure. That doesn't stop them from tweeting. Consider Dekker last year. With Houston on the clock, Dekker's brother, John, saw a report on Twitter that the Rockets were targeting someone else. After his phone blew up, he saw new information and told his brother, "You're going to be a Rocket," only moments before commissioner Adam Silver made the official announcement. For Ben Simmons, Brandon Ingram, and the dozen other top prospects invited to the draft by the NBA, it will be a long day. Stauskas didn't sleep well in the weeks leading up to the draft; cross-country trips for private workouts, plus media and sponsor requests don't help. He didn't get to sleep until 4 a.m. the night before the draft, and that was after adjoining the two beds in his room to make a giant sleeping space. While any player can attend the draft ceremony, those expected to be chosen with the top picks have an entire day of scheduled events. Of course, many are teenagers, so they have trouble keeping track of everything. (The three players I shadowed were considered old for having stayed in college two or three years. Each of the first eight picks in last year's draft was a 19-year-old with no more than one college season under his belt. They still couldn't legally enjoy a beer while watching Sunday's NBA Finals.) If past drafts are any indication, Buddy Hield and Kris Dunn -- who spent a combined seven years in college -- will be the go-to guys for logistical information. An 11 a.m. ET meeting in which a current NBA player implores the prospects to celebrate responsibly is followed by lunch with Silver. Fashion is important. The prospects typically wear one suit for the day's events and change into another for the actual draft. Burke wore a custom-made suit from a high-end clothier in Michigan; his color scheme paid homage to his alma mater. Dekker, who was dressed with the help of a stylist, had his late godmother's initials embroidered on his shirt cuffs. Jackets with college jerseys sewn on the inside were all the rage a couple of years ago. Last year I noticed a lack of socks. 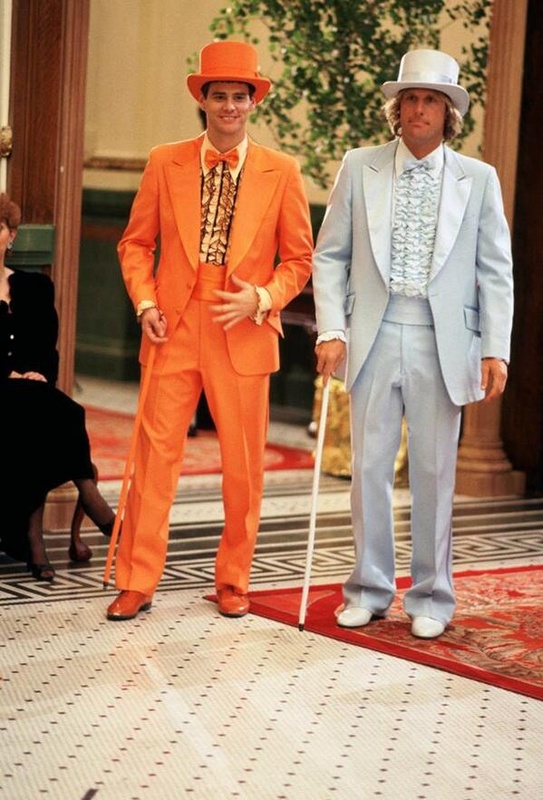 We've got two Kentucky teammates in attendance this year: Is a Dumb and Dumber-inspired ensemble too much to ask for? A couple of hours before the cameras start rolling, the prospects take a bus from the hotel to the arena. They'll use Twitter to thank the brands that provided them with free goodies -- headphones or phone chargers -- and read about themselves. Stauskas was thrilled about receiving the site's "verification check" in the days leading up to the draft, and later got a Twitter shoutout from Drake. Outwardly, he was more pumped about these developments than joining the Kings. Once inside Barclays, they pose on stage for group photos. In 2013, Victor Oladipo tells Burke he's shivering, a sign of nerves. "Feels like a championship game, don't it?" Burke says. The players will take a seat at their assigned table in the green room* along with, usually, some combination of their parents, siblings, agent, and college coach. Like many families, the Stauskas' watched the draft on TV for years. They say to be there with a draftee is surreal. * The green room is neither green nor a room. It's a roped-off area in front of the stage. At 7:30 p.m. the commissioner will put the Philadelphia 76ers on the clock. Though the draft is simply an announcement of names, the 30 picks of the first round will take more than three hours. If you think it seems slow on TV, try attending. The time between picks seemed like an eternity to me, and I had no direct stake in where any of the players went. Last year, Dekker kept waiting as the draft moved past the lottery teams. To help ease the tension, Packers quarterback Aaron Rodgers, whom Dekker first met at an awards banquet in high school, texted him, reminding him to smile: "Be patient. You're going to a playoff team." Like many fans, the players furiously check Twitter, hoping for some meaningful news from insiders like Adrian Wojnarowski and Jonathan Givony. Burke's dad saw the latter had tweeted that Minnesota would draft (and potentially trade) him seconds before Silver announced it. The time from when Silver takes the stage to when a player is picked is described as "excruciating" and "nerve-wracking." During the pre-draft process, teams will tell prospects things like, "You had a great workout" or "We're very interested" or, in some cases, "We'll draft you if you're available." But that plan can change if a different player unexpectedly slips. A pre-draft promise holds no weight come Thursday night. Not until a player's phone rings with a call from an unfamiliar area code can they get excited. It is the coach or GM or team president on the line welcoming him to the franchise. That's what happened with Stauskas. In some cases, there's not enough time, and Silver's announcement is the only confirmation. Moments later, the player is walking on the stage to shake Silver's hand. The commissioner told Dekker, after he went No. 18 to Houston, that it was the worth the wait and he was headed to a great organization. Keep in mind that at this time a year earlier, many were on stage receiving a high school diploma. The post-selection media responsibilities -- dozens of photo shoots and interviews in which they're asked the same questions by 15 different people -- can take hours. The process does allow for the magnitude of the moment to set in: Dekker catches TV highlights of the Rockets in the middle of his presser and is asked about playing with Dwight Howard. "When you said Dwight, it got me excited because if I get in the paint, I can just throw it up in the air and Dwight will go get it," he says. "Or if I pass it to James [Harden], I'll get an assist automatically." Even without being involved in a trade, mid-first-round picks won't leave the arena until midnight. They'll have scores of texts and missed calls. Actually, if a draft pick left his phone on vibrate the entire day, his thigh would probably be numb by early afternoon. They'll celebrate in their own ways. Burke had a party for family and the bus load of friends who made the trip from his hometown of Columbus, Ohio. Dekker's story likely tops that of any draft pick: He bar-hopped with Rodgers. Other than the size of the initial contract, a player's draft slot means nothing. The NBA is a ruthlessly competitive business. Roster spots are not unlimited. Some veterans will retire this offseason. Others will be cut and forced to play overseas. But the majority will return, disinclined to cede their jobs to the new class of rookies. Getting drafted is the realization of a lifelong dream. But really it's just the beginning. Andrew Kahn is a freelance writer who has written for The Wall Street Journal and Basketball Times, among others. Learn more at AndrewJKahn.com, listen to his Scoop and Score podcast, email him at andrewjkahn@gmail.com and follow him on Twitter @AndrewKahn.